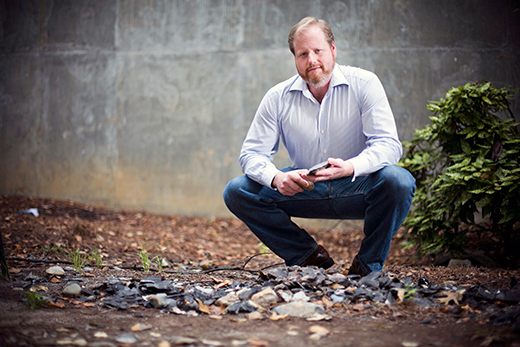 Emory anthropologist Dietrich Stout, who incorporates neuroscience into his research on Paleolithic tool-making, organized the “From Tools and Gestures to the Language Ready Brain” event on April 12 to advance discussion on the origins of language. Registration is required for the half-day conference. For more information on either event, please call 404-727-7518. Prominent researchers from around the globe will visit Emory University this month to discuss how the handiwork needed by our stone-age ancestors to develop tools may have paved the way for language. Anthropology professor Dietrich Stout, who incorporates neuroscience into his research on Paleolithic tool-making, says the half-day “From Tools and Gestures to the Language Ready Brain” event on April 12 is designed to advance discussion on just where language comes from. Scientific American has profiled Stout and his research on the topic. His essay on the effect of tool-making in human brain evolution, "Tales of a Stone Age Neuroscientist," is the cover story in the April issue of magazine. Erin Hecht, a research scientist at Georgia State University who earned her neuroscience doctorate at Emory in 2013, will discuss the brain differences between humans and chimpanzees and how those affect their ability to imitate. Atsushi Iriki, a researcher at the Riken Brain Science Institute in Japan, will describe his groundbreaking work on the structural changes seen in the brains of monkeys trained to use tools and the possibility that humans have accelerated their own evolution by adopting such novel behaviors. Virginia Volterra of the Institute of Cognitive Sciences and Technologies in Rome will present research on the development of gestures in children and the implications the findings may have for language evolution. Primate cognition expert Richard Byrne of the University of St. Andrews in Scotland will close out the conference by discussing ape communication — and whether the natural use of gestures in wild apes can ‘bridge the gap’ between animal signals and human language. An evening event featuring paleoanthropologist Zeray Alemseged will round out the day. Alemseged, chair of the anthropology department at the California Academy of Sciences in San Francisco, found “the world’s oldest child” when he unearthed the nearly complete fossilized remains of a 3.3 million-year-old Australopithecus afarensis (famous as “Lucy’s" species) child in his native country of Ethiopia in 2006. His address will shed light on the locomotion and behavior of this pivotal species. Alemseged will speak at 6:30 p.m. room 208 of White Hall. His address, which is cosponsored by the Emory College Department of Anthropology, Leakey Foundation, and American Association of Physical Anthropologists, is also free and open to the public.